Sorry, I know I should do a proper intro for this blog and everything, but at this point, I think we all need to let out a guttural sigh first. But because this concerns the Real Actual President of the United States, and the despised and loathed Chicken Tax—a 25 percent tariff on light trucks that has had an enormous impact on America’s auto industry over the last five decades—here we are. President Donald Trump is still mad about GM laying off thousands upon thousands of workers, especially in Ohio, which Trump won by wildly overpromising to not only keep the factory jobs in Ohio but to also increase the amount of factory jobs in Ohio. That means he’s tweeting about it. The Chicken Tax has been a pox upon our vehicle-loving and tax-paying house for a staggering 56 years. 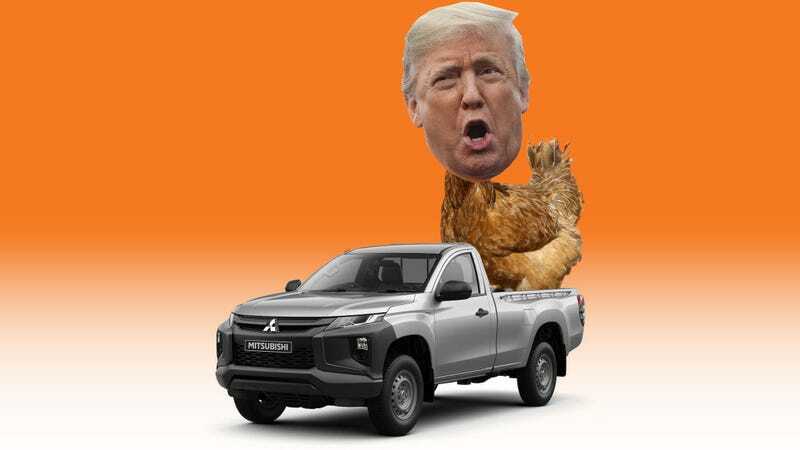 A 25 percent tax on imported pickup trucks, it was supposed to be a retaliatory tariff after some European countries slapped protective tariffs on cheap American chickens back in 1963—hence the name. They tax our chickens, we tax their trucks and vans, to the point where it’s not even worth it for them to sell them here. But in effect, all it’s done is made the American car market more closed off and with fewer choices, in a way that has stifled innovation. And while there are definitely ways around it, they’re dumb and expensive and pointless. The Chicken Tax just doesn’t make sense anymore, and it’s doing more harm than good. For example, Ford, one of the companies the Chicken Tax did the most to protect, is a much more global company today. That means this American company sometimes builds trucks overseas and brings them back into the US, as they do with their Transit Connect van, which is built in Turkey. To get around the Chicken Tax, it comes to the US with seats and windows, both of which are removed upon entry. It’s wasteful and crazy. Even worse, the Chicken Tax has caused the US truck market to stagnate without competition. The US builds some terrific full-sized trucks, but you’re out of luck if you want anything smaller. And even those full-sized trucks are getting to be pretty damn overpriced. And as we noted at the time, the increased competition led to some pretty incredible products, even from American truck manufacturers, ranging from Corvair vans to innovative little pickups. But nowadays your pickup trucks are pretty much limited to the large Chevy Colorado/GMC Canyon, the Ford Ranger (which has already existed overseas since 2011, and which Ford didn’t bring here until now because of the Chicken Tax), the even huger Ford F-Series, GM Silverado/Sierra, the Ram pickups, and the very American-style trucks made by Toyota and Nissan. Those are even made in America. You could possibly count the Honda Ridgeline as well, also made in the U.S. Overall, a pretty limited market considering what a huge volume of sales and profits it makes up. And, Ridgeline excepted, one that follows largely the same pattern of what works. What that’s done is made the U.S. truck market very risk-averse and focused only on the trucks that make the most money: full-sized pickups. Any experimentation with more niche or limited-market vehicles, like, say, a non-huge pickup truck, just isn’t worth trying, financially, thanks in large part to the Chicken Tax. The Chicken Tax didn’t even do what it was supposed to do. It didn’t protect American industry building interesting work vehicles for the American market. With the reduced competition, American manufacturers just stopped trying. Instead of truly small American pickups flourishing, they don’t exist. Today our automakers don’t even really try making truly small, cheap trucks anymore—they want you to finance that new Silverado for $50,000 or more, because they need the profit margins. Which isn’t to say they don’t exist anywhere else. Pickups like the Nissan Navara, the Volkswagen Amarok, and the Mercedes X-Class are sold without any problems all over the world – except the United States. In short, all the Chicken Tax has accomplished is to make things worse. Instead of accomplishing its original goal, it’s done entirely the opposite. “Many more cars” aren’t built here. It’s just killed entire market segments. And now Trump wants to extend it to every single vehicle imported to America. It’s hard to really fathom what that would look like, but it could make our choice of vehicles as domestic and insular as it was at the darkest moments of the industry. It could, conceivably, even force some manufacturers out entirely, like Mazda, Volvo, and Audi, which primarily make mass-market cars outside the United States. And even though some of them are “premium” brands, who the hell wants to pay a 25 percent price increase on any car? And good luck to even smaller foreign manufacturers, like McLaren and Ferrari, no matter how much those customers are willing to pay on top of the normal premiums those cars sell for. In case you think I’m exaggerating, the McLaren Speedtail isn’t being sold in the U.S. for road use over its seating position and sideview mirrors. What do you think a 25 percent price hike would do to the rest of the lineup? If it happens, kiss the cars you love goodbye.